We are driving away from the small towns of the area and towards just mountains and a long and relatively untouched river. We stop at the café in North Fork for a scoop of huckleberry ice cream. Then it’s back in the rig, a trailer of boats creating dust behind us. We drive along the river as the canyon and road narrows. We pass the Middle Fork, Panther Creek, Shoup and the infamous M-T Saloon. Finally, we drive into Corn Creek, the put-in for the River of No Return. The Salmon River glides over and past the concrete boat ramp. Determinedly unfazed by the pre-trip commotion, it bends out of sight downstream. 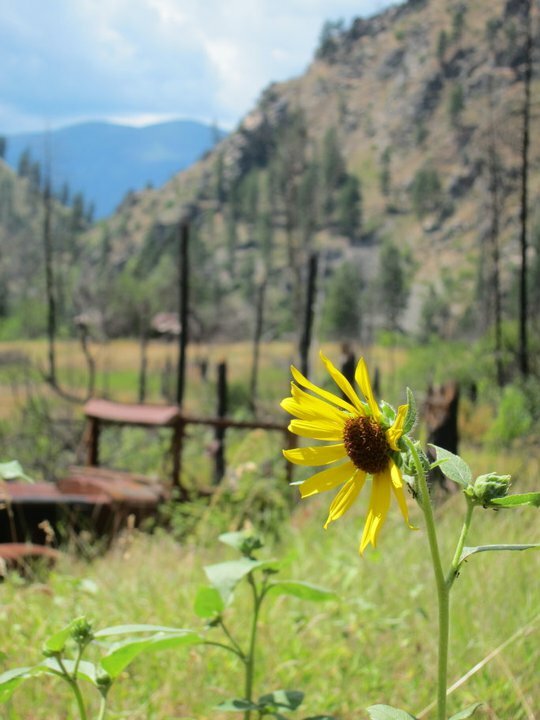 Cutting from east to west across the Frank Church Wilderness is the River of No Return, an Idaho gem. More hospitable than the famed Middle Fork of the Salmon upstream, yet more protected by geography than its mother river the Snake, the River of No Return is a unique river corridor. Like many protected wild areas, this canyon is used by a variety of recreationists from boaters to hunters to backpackers. 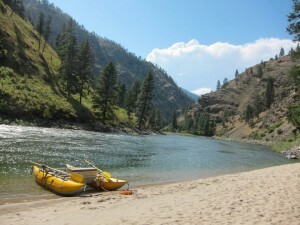 Yet the river also boasts over a half-dozen working ranches and lodges with year-round residents. An adventure down the wilderness section of the River of No Return allows a traveler to peel back layers of the history of the west. Within a mere one hundred river miles, we can study pictographs of the Shoshone-Bannock Indians, stand in the foundation of a Chinese miner’s stone home, and follow the cliff-side catwalks of a hermit determined to out-smart the Forest Service. We find graves and cabins of homesteaders and pit-houses of the Nez Perce. We can imagine the generations of human and animal inhabitants, starting with current ranch caretakers and expanding far back in time, who have made these river bars home. Few other areas in the West have a river community of past and present so available. A visitor can come, choose an era, and be transported. As river guides, Kelly and I are both lucky enough to call this river our “office” for a few months per year. In partnership with the Salmon River Outfitters Association, we’ll both spend the next few months exploring the history of the River of No Return, from the end of the road at Corn Creek to the reemergence of a road at Vinegar Creek. Much like the river adventures we enjoy in the summer, we will explore the canyon mile by mile – a historical exploration to pass the time until the ice bridges melt and we can boat our favorite canyon again. We are down at the edge of the boat ramp now, rigging our boats. I pull a strap down tight over my gear in preparation for the whitewater-filled, roadless canyon ahead. Grab a personal flotation device and your camera and join us, won’t you? You never forget a journey down the River of No Return.